Longer days, warmer weather, pizza delivery and oh yeah, ponies! 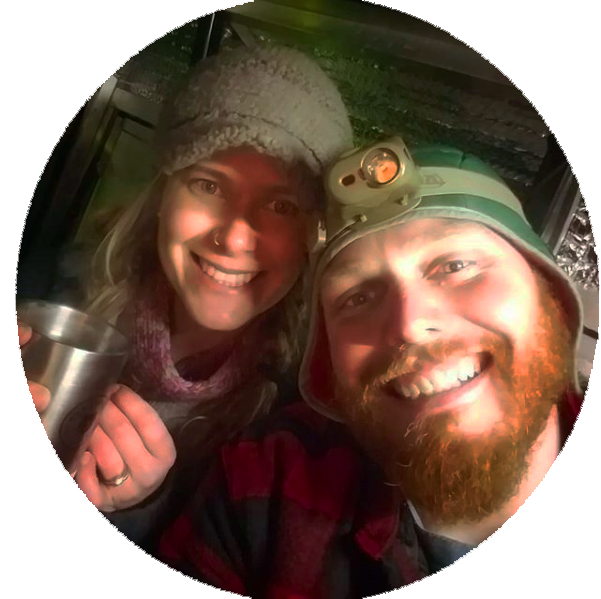 We haven’t been posting for the last couple days because we’ve been out in the woods taking care of our primary job – getting to Maine on the Appalachian Trail. Often to my chagrin, or blatant disgust, I am still carrying a small tablet while climbing hills. This has allowed us to write while walking, however, so we’ve post-dated several more posts for the next few days. Make sure to check back! So, ponies you ask? Did we get off the trail during a carnival in town? Did we walk near a petting zoo? Did Lindsay get sick of carrying her pack and hire out the work? None of the above, actually (although if the offer was made both of us would let a pony carry our packs for the day)! Clay petting the baby pony. 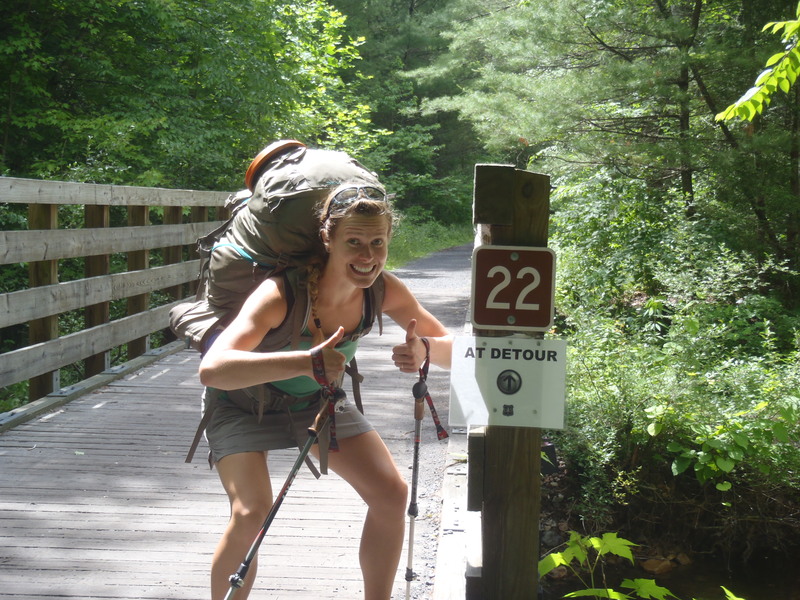 In the southern part of the Virginia Appalachian Trail you walk through the Mt. 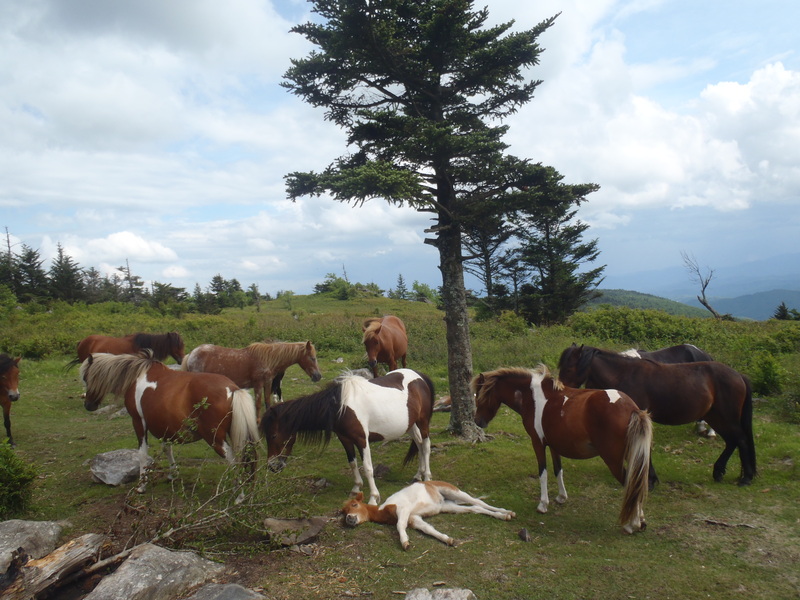 Rogers area, which is not only the tallest point in the state, but also home to the Grayson Highlands and multiple herds of wild (and partially desensitized to humans) ponies. 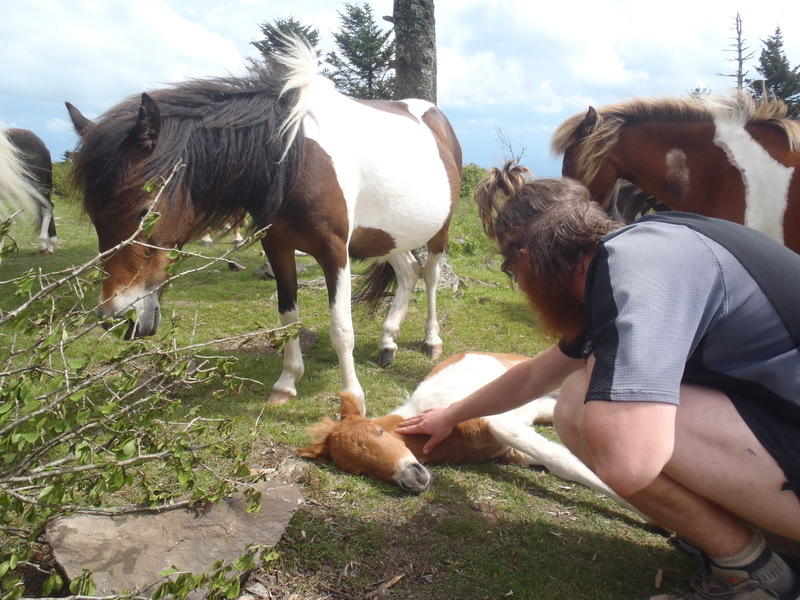 In what turned out to be one of our most unique trail experiences so far, we ate lunch next to a resting herd that allowed us to come and pet not only the grown adults but also month-old sleeping colts! Sometimes stopping go smell the roses is more important than logging in the daily miles, so we cut the day short to play with the ponies and set up our tent high on the edge of a mountain meadow that had views of not only a beautiful sunset but also dozens of grazing, undisturbed ponies and even a pair of grazing steers! The herd of Grayson Highland ponies that we played with! Lindsay eating some delicious pizza while still on the trail. Hooray! The other blog-worthy experience from the last ten days involved gorging on some badly needed pizza calories and a rather steep credit card charge to allow the gorging to happen while on the trail! There happens to be a shelter close to Marion, Virginia that is located just behind the parking lot for the regional National Forest Service office. Proximity to a city and a paved road only 1/4 mile away means one thing for hikers; pizza delivery! 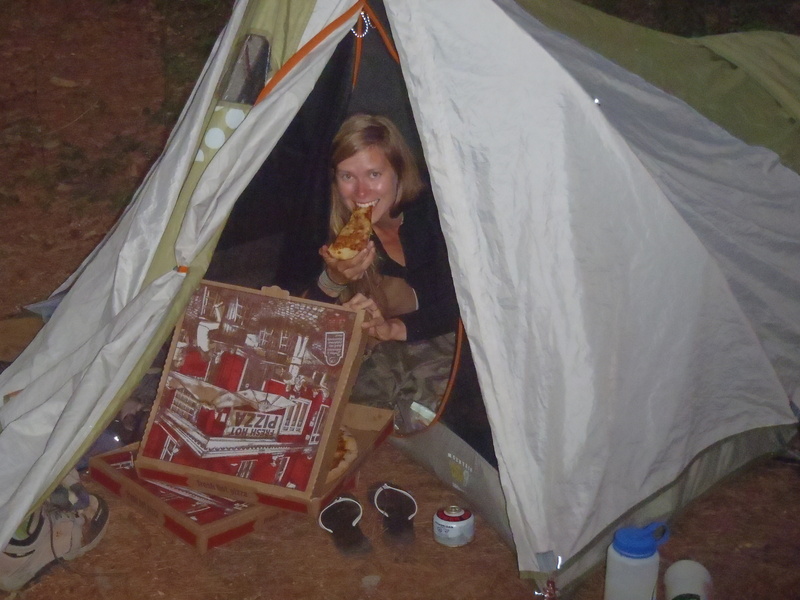 It is almost a right of passage or just simple hungry hiker tradition to order pizza from the Partnership Shelter. In true Fat Kid fashion, Lindsay and I ordered three of their largest pizzas, onion rings and a salad for just the two of us. The calories were needed, the greasy food baby, not so much. Nonetheless, we had a feast for dinner, half a pizza for breakfast and even snacked on a few leftover slices as we walked the next day. Morale went up and our tummies were full, so you don’t hear this guy complaining! 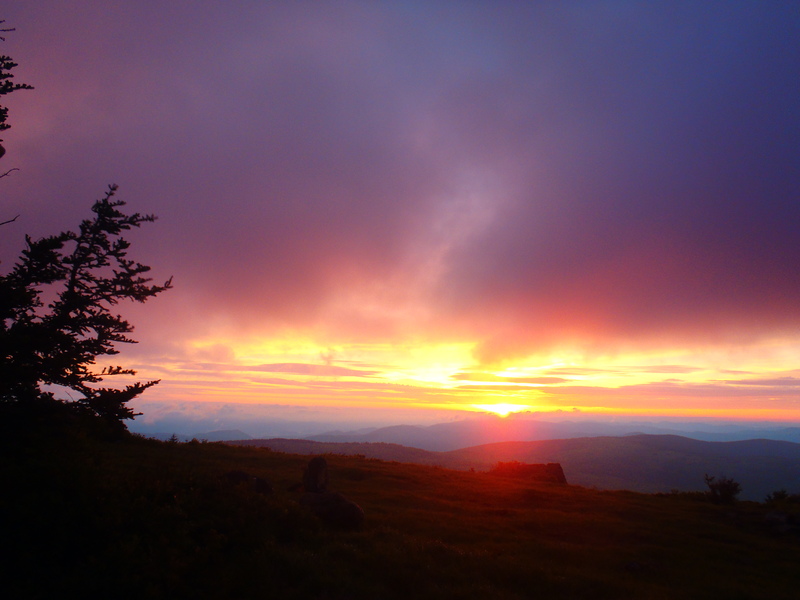 Sunrise on the Grayson Highlands, sometimes you just have to love the trail. Besides that, the last several days have really all blended together. After dodging thunderstorms, sometimes successfully, sometimes not for a week, we have been blessed with clear blue skies and not a cloud in sight the last couple days. Of course with the clear skies comes higher temperatures and the little pocket thermometer on Lindsay’s pack has consistently hit the 80’s. Normally with being higher in elevation from the towns that the weather is forecasted for and walking through the shaded forest allows for about a 10 degree temperature relief. Now that summer weather is upon us and we’ve dropped out of the 5,000ft (+) mountains of North Carolina we have traded exhausting hill climbs for equally exhausting temperatures as we continue our journey north. To combat this we’ve been forced to stop walking in the heat of the day on sunny days and start planning a day or two in advance to make sure we have plenty of water where we rest midday and sleep. Despite the changes that the weather has forced upon us, we are still making great time and are on pace to be back to our original September 30th finish. We’ve been putting in some longer days, breaking 20 miles in a day for the first time (wohoo! ), and averaging 18 miles or so for the last 9 days since leaving Damascus. This improvement isn’t an effect of longer hours walking, rather we have been walking about the same 8 hours or so a day. 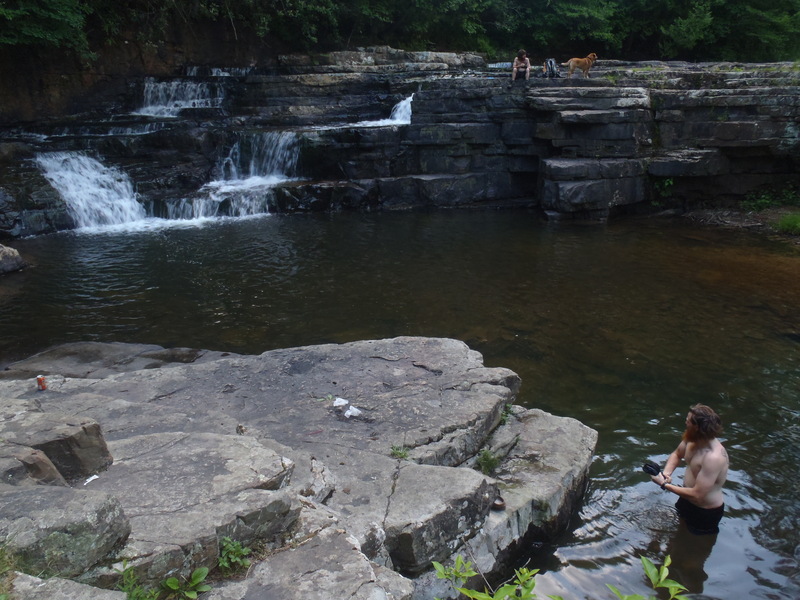 Between learning more efficient uses of our time in camp, and more importantly with the smoother, more level terrain of Virginia coupled with our increased trail fitness we’ve recently been going further than anticipated. We found a trail detour because of a bridge washout and it cut off half a mile. Hooray! The terrain is probably the most interesting part though; we still have uphills and downhills, except instead of them occurring one miserable hill right after the other it is a much tamer topography. It is almost like someone put our elevation profile through a wood planer, knocking the tops of the mountains and the deep valleys into flat, smooth and easy walking stretches of trail with a climb or descent every 5 miles. All we can hope is the easy miles and nice trails continue for the last 400 miles of Virginia, not just the first 150! Boy, I can hear clay complaining about the price of all those pizzas from here! Keep up the beautiful photos! Miss you guys! Say hello to turtle for me! So glad you’re doing well and also, that you got to enjoy the ponies. You are now north of them and hiking where I’ve never been. Looking forward to your next posts….stay safe, Michele Hunt.